Sara and James Neeley got all shook up at the Elvis Birthday Celebration Friday at the Cannon County Senior Center. Elvis stills lives in the hearts of his fans. Born Elvis Aron Presley on January 8, 1935, in Tupelo, Mississippi, (he later changed the spelling of his middle name to the biblical form of Aaron) from very humble beginnings, Elvis Presley grew up to become one of the biggest names in rock and roll. He was originally supposed to be a twin, but his brother Jesse Garon (sometimes spelled Jessie) was stillborn. Elvis died August 16. 1977, he was proclaimed the “King of Rock and Roll” by Disc Jockeys who would play his music on the radio; while being protested by the parents of his fans. When a person in the public’s eye dies, the public remembers them as they were when they died. Think back to JFK, James Dean, Amelia Earhart and Buddy Holly. If he had lived until today the King of Rock and Roll would have turned 75 years old Friday, January 8, 2010. People remember when he died, but they also celebrate his birthday. The Senior Center of Cannon County celebrated the King of Rock and Roll with memorabilia and movies of Elvis. Jacqui Head presented the program which included trivia of the man and his music. Songs were played from his digital records and when she stopped the music someone who knew the next lyrics would finish the song. You would be surprised how many knew the words to the music and what movie they might have come from. During the music some of the seniors got up to dance, some danced by themselves and others picked a partner to dance with them, in the song Jail House Rock, Elvis sang “ if you can’t find a partner use a wooden chair.” One man danced with a mop instead of the wooden chair. For a snack the women brought out a peanut butter and banana sandwich and a guitar shaped cookie to eat. If Elvis were alive today, what would he be doing? That is a question his ex-wife Priscilla often thinks about. She told an interviewer this morning that Elvis would still be involved in music, but he probably would be into preaching the Gospel. Even when they were together Elvis was really religious being brought up in the Churches of God. Elvis won three Grammies for his Gospel albums. 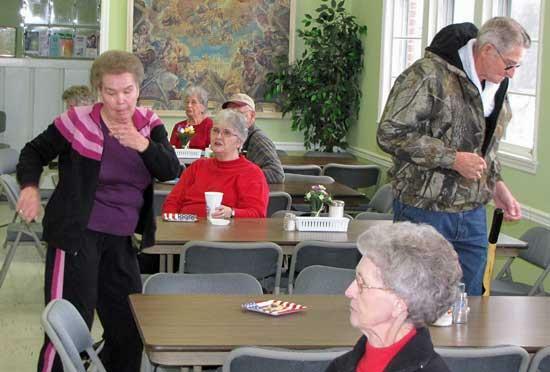 The Cannon County Senior Center is under the direction of Connie Rigsby, the seniors and Connie have a good relationship and Connie and the staff always has something going on for the members. Just like the birthday party for Elvis; which was enjoyed by everyone present. We have lots of fun at the Senior Center.